You must make reservations at least 5 minutes in advance of the time at Menotomy Grill & Tavern. Easily accessible from Cambridge and just off of Route 2. Live music Thursday 9:30 p.m.
war as a tribute to Arlington National Cemetery. loyal following will be the key to our success, so we welcome you to join us on Facebook for news, special offers and exciting events. Top shelf blues music every Thursday from some of the best musicians in New England. Terrific guests sitting in. At the top of my list for blues jams spots. Courteous service, good food (but not amazing) this place is an excellent place to spend time with friends. The Banh Mi was unconventional -- sausage -- but was as delicious as banh mi gets. The beers were excellent too. The only shortcoming is the place is loud. Gracious hospitality, an excellent place to spend some time. Good service, good food. Menu is OK, not outstanding. A bit noisy. Server was outstanding. Food was really really good. Very happy to have visited. Great place to go with friends. Good food, nice vibe and ambiance. Waiter seemed preoccupied and a tad impatient that my companion was running late (<10 minutes and I had ordered a glass of wine). 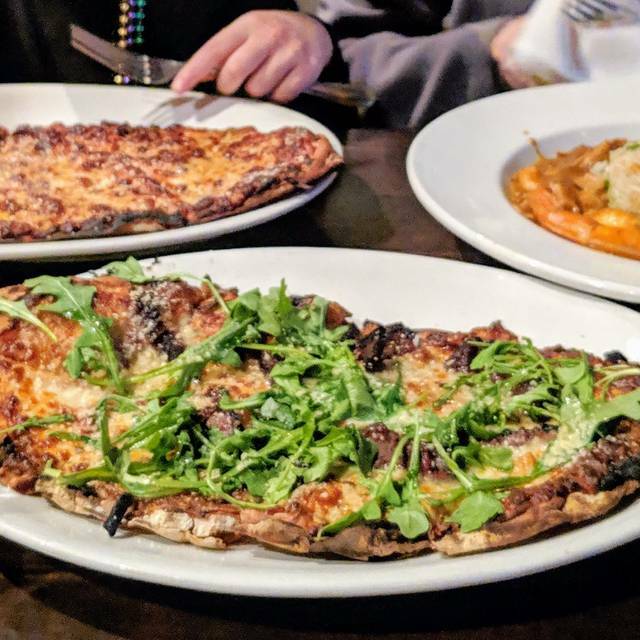 Food came out quickly and was delicious (we both had margherita flatbreads...highly recommend). Good food, impressive wine list, definitely would return. We sat at the bar and they were very attentive and cool even though we might’ve lingered a little too late. Menotomy Grill is a real local gem. 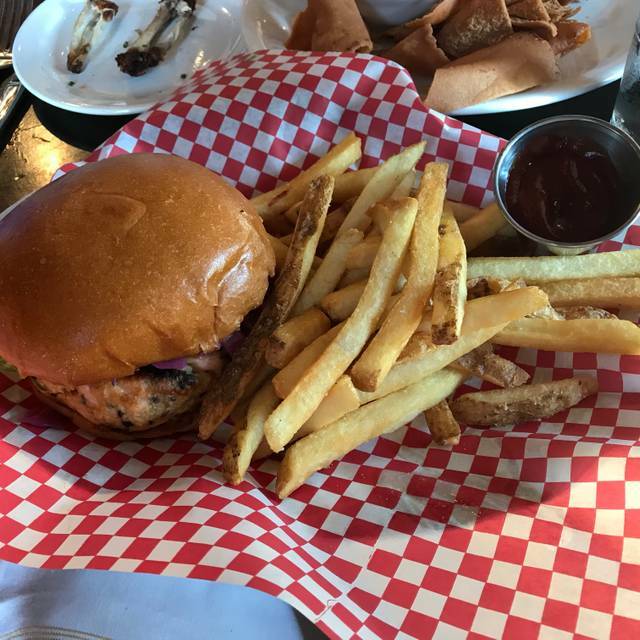 Great food, excellent service, and pleasant atmosphere. Menitomy is my boyfriend and my favorite date spot. We always order the same thing: pistachio-crusted salmon with Brussels sprouts and bacon on the side. 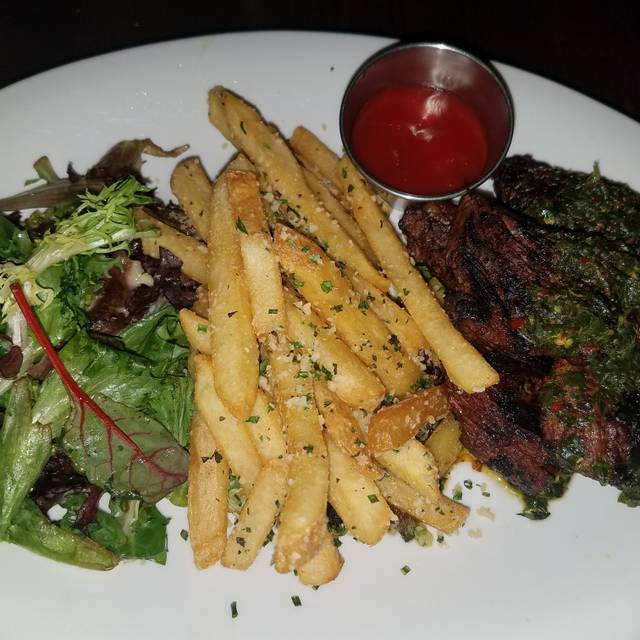 This last time we went, I ventured outside my typical salmon and ordered the steak tips with sweet potato chips, which was an AMAZING choice. I love Menotomy’s food, the service was great, and the ambiance is always warm and fun and perfect for a date night! It was St Patty’s day, they had some, but not too much festive decorations and fun accessories worn by the staff. Food was very good, stag polite and efficient. Another great outing at Menotomy!! irish stew had good flavor but carrots in it were practically raw, as if they were thrown in at the last moment. Ordered Greek salad with grilled chicken. 25 cents of chicken and they charged me $5.00 extras. Salad was more like mediocre Caesar Salad. Had a reservation and when I arrived saw a line to get in but was seated right away. Not my first time there and knew to get a reservation for Sat, Seated selection was good. Chose the daily special and What A Meal, is was excellent. Waiter was pleasant and friendly. While there menu is good, I always select the daily special since I know it will be a creative dish that challenges the palate. Enjoyed my meal. This place was close to our hotel where we had a short stay. I used Open Table app to book a seating for 3 on a Friday night which is one of their busiest. Service was great. My wife ordered a glass of wine and the wine glass was dirty with water spots. Very unappealing. Good thing it wasn't a high ticket glass. I ordered a dish which described itself as "Steak Tips"...it was not. Steak tips are typically tender marinated ends of sirloin. These were either flank or flat iron mini steaks and tough. My wife's side Caesar salad was too limp too eat. 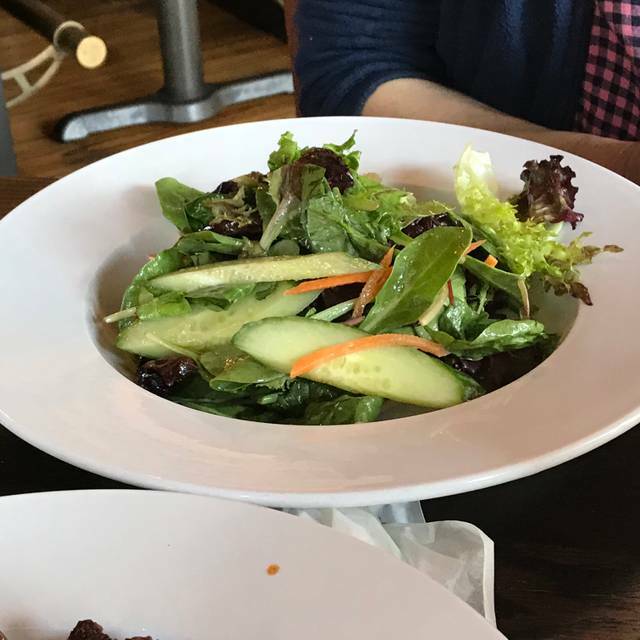 My green side salad was decent. We liked the convenience and the ambience of this place. We would go back but probably for something "safe" like a burger of ask the server for their opinion on a good menu pick. Great local restaurant with delicious food menu. Very kid friendly. Great live music and they also do a very nice weekend brunch. Nice place. Menu a little limited but the food was good and the prices fair. We had reservations for 8 on Sat. night at 7 abd were promptly seated. 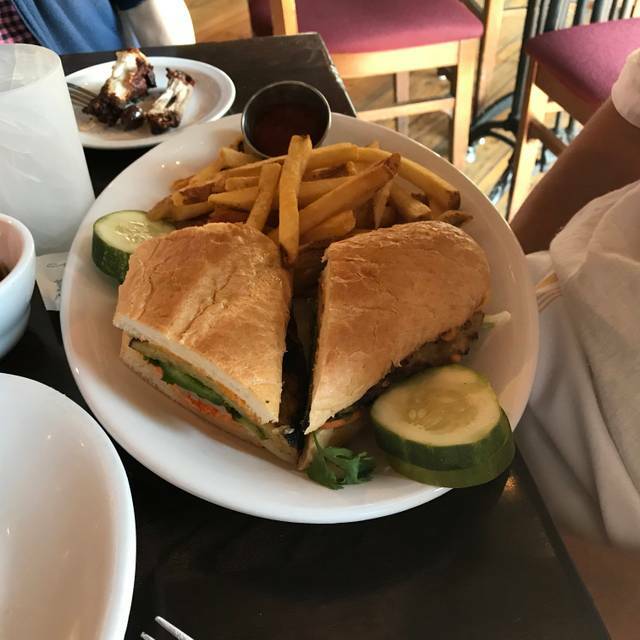 It was very busy, but our server Bob took great care of us - we could take our time, have drinks refilled and was he was very helpful and friendly. Food was more innovative and delicious than typical "pub food." Everyone enjoyed their meals. Noise level was a little high because restaurant was full, but we could still hear eachother without shouting since we were near the front. Highly recommend you try Menotomy. Easy access. Parking. Great menu and excellent food. Great service, too. Reasonable prices. I love to go there for lunch. During brunch you should be constantly refilling coffee! I was there over an hour and never got a refill. Manager was rude after we waited for our table and they did not have the booth we requested. It wasn't our problem that they were busy and we didn't need him to point that out. Our meal was really disappointing--specifically the salmon was seasoned on the skin side. Rookie mistake. Our waiter was fine but clearly wanted us to leave quickly. The back waiters were rude and neglectful. This restaurant is not remarkable enough to warrant such unprofessionalism. I won't go back. My wife and I visit this restaurant often. We are friends with one of the silent owners. This past visit was by far the worst. I ordered my burger medium and it came out rare. My wife ordered salmon and it didn’t come with the glaze or correct sides. We also had a hard time ordering drinks. I ordered a beer twice and had to ask again each time. Hate to send a bad review but because I ate 1/2 my burger the waiter said they couldn’t do anything about it. I should of sent it back right away. Sorry for being hungry I guess. We also witnessed three groups of people walk out because they weren’t being seated. They waited a long time. Seemed to me the service, kitchen and front house staff cared more about the 40th birthday that was there than the rest of the patrons. Food was cold and subpar. Server rude and snappy and rushed us. Disappointed. A fun place with a friendly staff and a pub atmosphere. Seating can be close. Food is always good and sometimes great (e.g. recent black bean soup special). Lots of beers to choose from but mostly IPA's on tap. Parking is somewhat limited. I have been 3 times in the past couple of months and have always had a good experience. Good dinner with the family ! We reserved a high top table in the bar area. The service was great and the food was excellent. We loved the decor and atmosphere and will definitely be back. Our family stopped at Menotomy for a Saturday night dinner. The place has a great neighborhood’sy feel to it. Our food and service were all great. My only complaint (more a request for the future) would be a more extensive wine selection. Plenty of beers and interesting cocktails though. Meh.. we've been passing this place for 4 years. Finally made an 8pm reservation for valentines day. We arrived about 5 till 8 to a crowded vestibule and told there would a wait while more people finish their meals. There was a list of walk ins who were sat and 3 or 4 other couples also with 8p reservations. After a 15 minute wait we were seated. Our server was cool. Our drinks were good (Rachel's rum punch and new old fashioned). 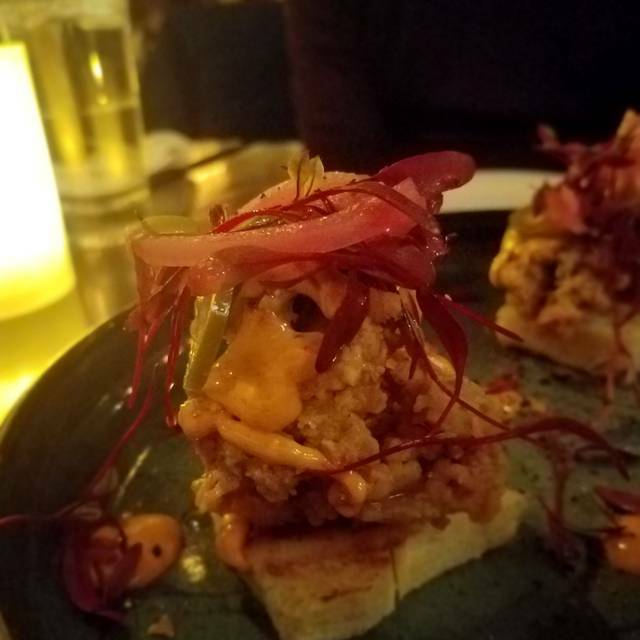 The fried oysters appetizer was awesome but overdressed. I had steak tips and fries. It arrived room temperature at best. 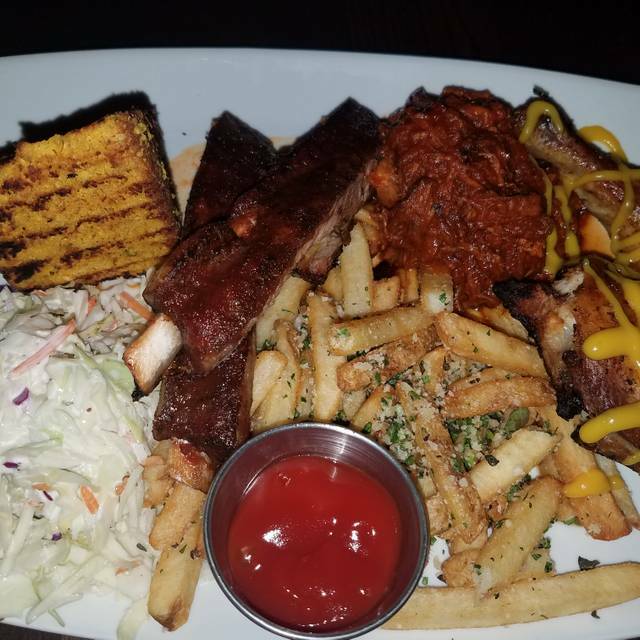 My date had bbq trio. The sauce on the pulled pork for sooo vinegary and neither of us liked it. The chicken leg and rib was good. 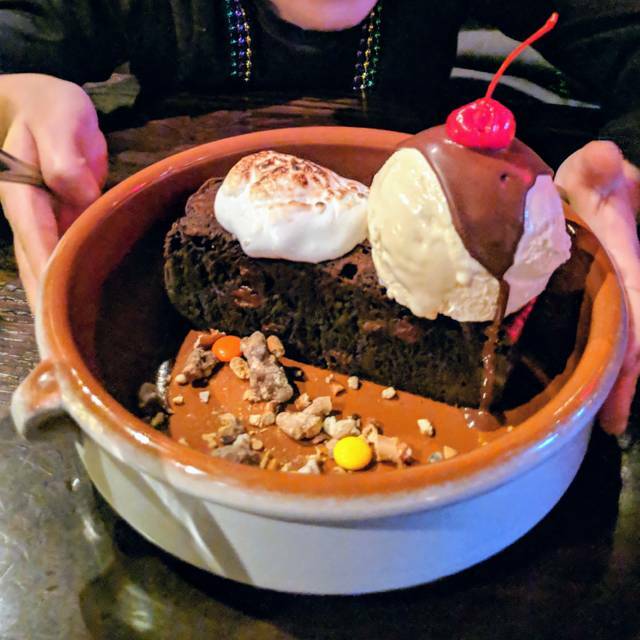 We thought both portions were fine. There's a band on Thursdays. Parking lot. A couple TVs for game day. 97$ + tip for 2 cocktails, 1 app, 2 entrees. Went here for Valentine’s Day. Everything was great, drinks, appetizer, both meals and dessert. We will definitely be coming back to try more items off the menu. This place is a great option in the area. My only wish would be that they menu be truer to a tavern menu. Some of the food options are a bit too fancy. A Tavern to me is homestyle food - maybe more steak tip options besides 'chimi churri'? In any event we dined here on the worst possible day of the year - valentine's day - where usually everyone from the kitchen to the bar staff are so busy that the dining experience suffers but that did NOT happen here! They did a great job. We voiced our only complaint, the French Onion Soup which tasted awesome was not that hot - they responded with free dessert! The beer list is eclectic with British, German, and Micro-brews. They wine list looked good. The wife got the beef short rib special & I the lobster special. Both were fantastic. Prices are very reasonable! Four of us enjoyed a great dinner last Saturday evening. We sat in a booth in the bar area as requested. The menu is lengthy plus there were specials. We enjoyed tacos, salmon, mussels and pizza plus excellent craft beer and wine. Our waitress was very attentive. My husband and I have been here several times and will continue to return. Also there is a parking lot. If we stayed longer we could have enjoyed live music. Service was great, and food was awesome! We’ve been here several times and I feel like every time we are here the food gets better and better!